Looking for some new shoes? In this buyer’s guide, we’ll review the top 9 best disc golf shoes on the market right now. But first, we’ll discuss some key things to consider when buying, helping you pick the perfect shoes for your specific needs. First, let’s discuss some things to consider when choosing a new pair of disc golf shoes. What makes a disc golf shoe? As you’re probably aware, only one or two companies globally make shoes specifically for disc golf. You can use trainers, indoor soccer shoes, or skate shoes on the green, but it’s probably not a good idea. They’ll get dirty very quickly, and the constant planting, rotating and toe dragging will tear them apart in no time at all. Golf shoes – the spikeless ones, with rubber lugs. Both have their advantages and disadvantages, as we’ll discuss below. Shoes designed for hiking/trail running will obviously be very tough. They’re meant to get wet and dirty, can withstand just about anything you throw at them, and are almost always waterproof. However, sportier golf/athletic shoes will be lighter and more breathable, which is very useful in humid conditions. They enable you the full range of movement required to plant your foot, pivot, and drag your toe with ease. But they might not stay dry on incredibly dewy mornings. Ultimately, the best disc golf shoes out there will strike a nice balance – not too thin but not too hot. You should also consider your environment – if you live in the south-east for example, it might be worth prioritizing breathability over a little extra thickness. On the other hand, if you often deal with muddy, dewy, heavily-forested courses, hiking shoes will tend to last a lot longer. The last thing you want when making a crucial putt is to slip and lose your balance mid-throw. 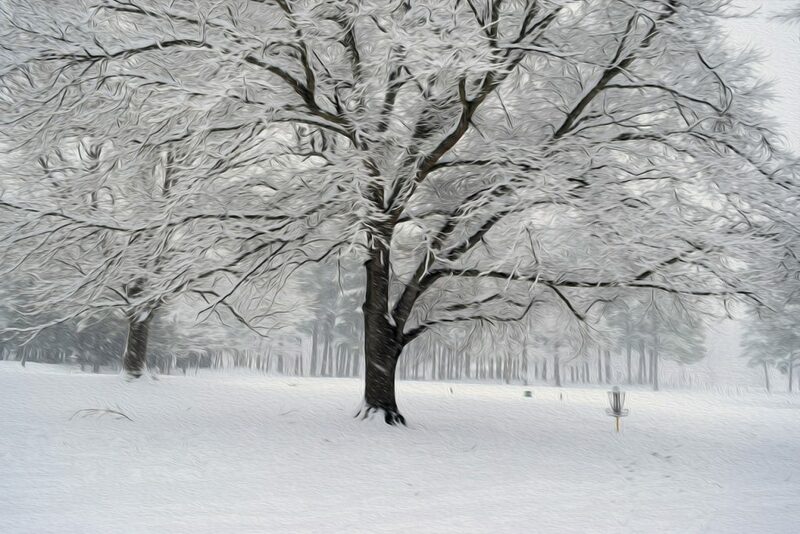 This is why it’s so challenging to play well in frosty/wet conditions. Most of the better-quality disc-golf shoes out there have a thick rubber outsole with really deep tread marks (a lug sole). Wearing these sorts of products, you can traverse wet grass, rotting leaves and frost-covered dirt without slipping up. The best thing about prioritizing grip though is the confidence it gives you as a thrower. Nothing beats being able to throw as hard as you like (and using any technique) without having to worry about falling over. For the most part, you should probably stick to your regular shoe size. Be sure to find out if the shoe fits big or small though before buying. If you’re stuck between two different sizes or half-sizes, it’s probably a better idea to go a size down rather than a size up. The last thing you want is your foot slipping inside your shoe as you pivot on wet grass. 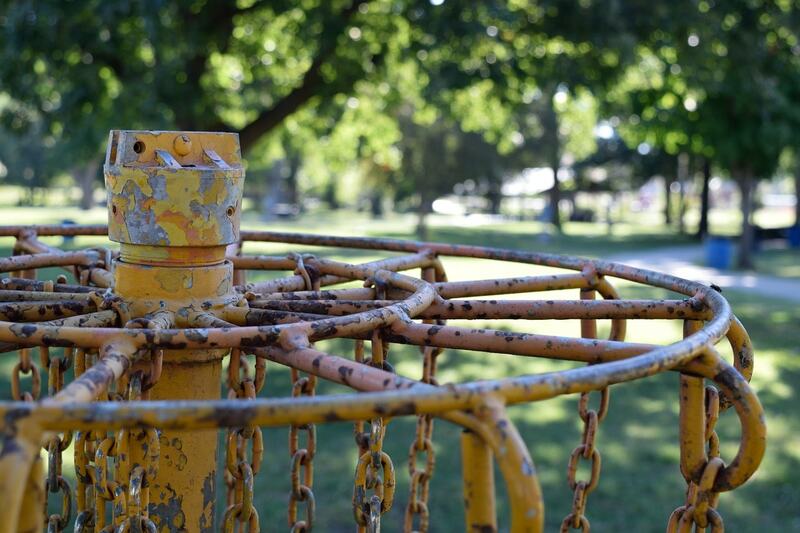 Not only can this mess up your throw, it could also lead to serious injury if you fall over. However, you definitely don’t want your shoes to be too tight – this will lead to even greater discomfort in the long run. What are the best brands to go for? Old-school sport shoe brands, like Adidas, Under Armour, and Puma. Hiking/trail shoe brands like Keen and Merrell. Neither is strictly better than the other. As a general rule though, companies which normally specialize in hiking-style boots tend to make tougher disc golf shoes. On the other hand, shoes from athletic brands will often be a little bit sportier (meaning they have better breathability and flexibility) but may not last as long. Only specialized disc golf brands like Latitude 64 currently make shoes designed specifically for disc golf. Adidas has a few regular golf options which are good value, while Under Armour makes hiking boots – some of which work well for disc golf. Confusingly, Puma includes the word “disc” in some of their product titles, referring to the contraption their shoes come with which you use to tighten up your laces. So if you type in “disc golf shoes”, just be aware that the majority of what comes up will actually be golf shoes. 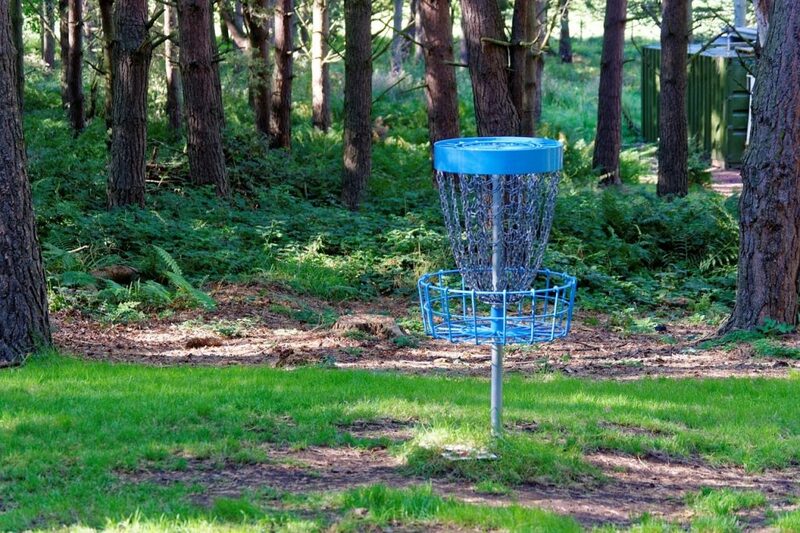 How much should I pay for disc golf shoes? There’s a massive array of different shoes available at a number of different price points. The cheapest options (in the $20-$40 range) just aren’t worth going for. They’re so cheap because they’re made with poor-quality materials and low-skilled labor. As a result, they often fall apart quite easily, especially when faced with harsh weather conditions. 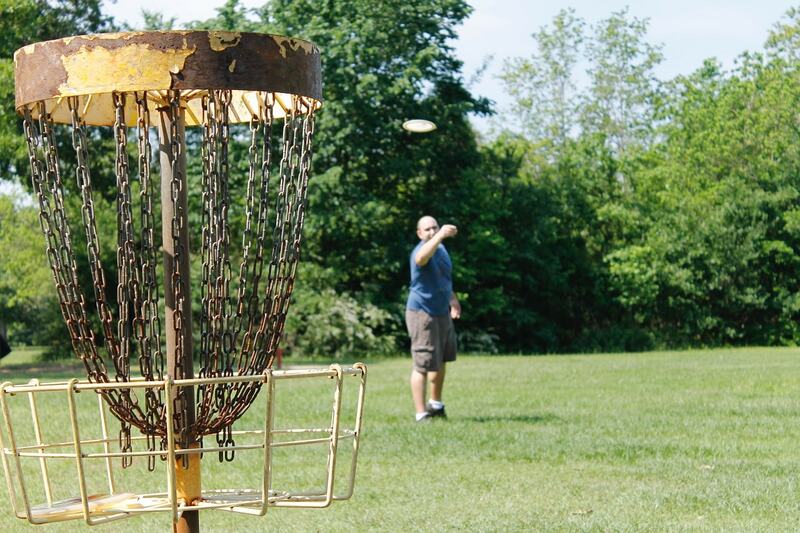 Similarly, you don’t absolutely need a $200 pair of disc golf shoes, unless you’re an aspiring pro. Although these more expensive products will feel awesome to wear and offer a good balance between waterproofing and breathability, they’re just not worth the money – most of the time, you can find a better-value option at a lower price-point. Your best bet is to go for a well-made mid-range shoe, spending around $80-$100. This enables you to get a quality product (which you won’t have to replace for absolutely ages) without breaking the bank. Be sure to look at each shoe on its merits though. There are definitely diamonds in the rough, as well as surprisingly average super-expensive shoes. An extended warranty, especially covering waterproofing. Some manufacturers will guarantee the quality of their craftsmanship, which is always a good sign. Excellent arch support, especially if you’re flat-footed. Ultimately, you want your foot to stay in place inside your shoe as you play, so getting the right size (and support) is very important. A padded insole. After spending hours on your feet, walking on something super-soft is a godsend. Good customer reviews. If you’re not buying a shoe designed specifically for disc golf, press CTRL+F and search for “disc golf” to find those who’ve tested the shoe on the green. Now we’ll review some of the best disc golf shoes on the market. This shoe was originally intended for regular (non-disc) golfers, and as a result, Puma have aimed to achieve a nice balance between comfort and support. It’s designed for traversing the green, but does well on uneven terrain as well. The sole contains what’s called “Ignite Foam”, which feels awesome to walk on even when you’ve spent the last four hours on your feet. Plus, you get an EVA midsole, and Puma say this shoe will remain waterproof for at least two years of use. One of the other things this shoe does differently to most others is the lacing system. Instead of just having laces you can tie up, you get a disc which has a dial on it, used for tensioning or loosening the tongue. To be honest, this system does take a bit of getting used to. However, it definitely makes it easier to put on/take off the shoe, and you won’t have to worry about the laces gradually coming undone as you play. What’s more, despite being completely waterproof, the TPU frame is pretty thin, meaning these shoes are very flexible and also well-ventilated. However, they’re not the most durable option out there – if you tend to wear out your disc golf shoes really quickly, check out the Merrell Moab 2. Innovative disc dial lace system. Very comfortable – particularly on the insole. If you often play on really tough terrain (on muddy turf, or in forests for example), it can be worth picking up a specialized hiking shoe for that extra little bit of sturdiness. As you’d expect from Merrell, this shoe does a fantastic job keeping out moisture, even on the tongue area. However, the actual outer is made of mesh, meaning it’s still fairly breathable. Although the outsole doesn’t come with spikes, the 5mm lugs do a fantastic job in terms of grip, even when you’re throwing on wet grass or a steep incline. You also get a blended EVA footbed, which has included arch and heel support. So if you suffer from fallen arches, this is a fantastic pick – with the right size, you won’t experience any annoying internal slippage, even when playing the hardest of drives. Plus, there’s an air cushion in the heel for a little extra comfort when you’ve been standing up for absolutely ages. At 1lb 15oz, these shoes are on the slightly heavy side. This isn’t a big deal for most players though, and considering what you’re getting, the price is very reasonable. Slightly heavy, but this is because it’s tougher than the average shoe. Latitude 64 are pretty much the only company which makes specialized disc golf shoes. 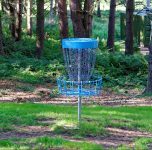 Since they understand the game so well, the company have added a few things which are really useful to disc golfers specifically. The shoe is waterproof, and the outsole is designed to grip even the most uneven of surfaces. In addition, the inner lining is very soft and comfortable, and the upper is nice and breathable. Another great thing about these shoes is how light they are – they’re about 1lb each, which is half the weight of the MOAB 2 we just reviewed. This helps you to be a little more nimble in terms of your footwork, enabling you to play your putts using whatever techniques you choose. This weight does raise an issue though – durability. These shoes aren’t incredibly tough, even when compared to the sportier Puma/Adidas options on the market. If you tend to drag your toe this can cause issues, and the seams can come apart over time. This is a pretty cheap shoe, which is probably why it’s not incredibly tough. Will come apart a little quicker than most other options. So far, we’ve looked at outdoorsy trail/hiking boots, as well as a few sportier options, including one designed specifically for disc golf. Each has its pros and cons – it can be hard to choose whether to prioritize durability or to go for something a little more agile. If you’re not sure what to get, this shoe from Adidas is basically a hybrid of the two designs. As it’s marketed as a hiking shoe, it comes with a thick lug outsole, and a waterproof lining to keep your feet dry. The upper is very tough, and the seams won’t split for absolutely ages, even with after hundreds of firm front-foot plants. However, Adidas’s sporting pedigree still shines through with this shoe. You get the company’s patented “ADIPRENE” material in the heel for added comfort, plus TPU in the insole for additional cushioning. It’s also quite light for a trail shoe, giving you the ability to play your full range of strokes. Overall, this is a well-balanced disc golf shoe, at a pretty reasonable price. It’s also available in tons of different colorways – there’s something for everybody. Excellent grip in any weather. N/A – excellent all-around disc golf shoe. If your local disc golf course is pretty much a golf green (meaning you’re not playing in a forest) you might not need a super-tough hiking shoe. The Adipower Sport Boost 3 is another traditional golf shoe. However, it doesn’t come with spikes which need replacing – you get a more modern rubber outsole, which offers excellent grip on grass. Obviously, this shoe isn’t going to be anywhere near as tough as something designed for climbing mountains, and its rubber spikes aren’t incredibly long. Despite this, it holds up pretty well when used on your average turf surface. It’s actually guaranteed to stay waterproof for a year, so you can still use this shoe if you play in long grass on dewy mornings. The Adipower’s upper is made of a special microfiber leather, which offers superb breathability and flexibility while still being incredibly lightweight. You also get Adidas’s specialized “Boost” material in the midsole, which is firm enough to offer support while still being plenty comfortable to walk on after hours of disc golf. The shoe fits true-to-size but won’t rub against your foot as you play – the inner material is extremely comfy. Ultimately, this is one of the most comfortable shoes out there you could feasibly use for disc golf. However, it’s not really suitable for those playing on courses with surfaces that aren’t mostly grass. Not designed for anything other than grass & bunker sand. As a girl, you don’t need to buy women’s disc golf shoes if you don’t want to – the range is pretty poor compared to what’s available for men. The only difference between the two is women’s shoe sizes are a little bit smaller. But if you are looking for a specialized women’s option, this is a fantastic pick. Like their Pwradapt model, the Ignite Blaze Sport comes with Puma’s lace adjustment disc, making it a breeze to get the shoe as tight or as loose as you want it. Interestingly, this shoe doesn’t come with a tongue, reducing the likelihood that water will seep in through the top in heavy rain. This may take a bit of getting used to, but the fit is excellent – no longer will you have to worry about blisters ruining your game. The spikes aren’t too long nor too short, meaning they do OK on tough terrain but still offer good agility on grass. This is a pretty sleek shoe – if you love to pivot on the ball of your foot or heel when throwing, it’s a great pick. You also get Puma’s “Ignite Foam” in the midsole, which is exceptionally comfortable to walk on. There’s a one-year waterproof guarantee, but the shoe is still very lightweight. As a sportier option, it’s not super-duper durable, but should hold up for a year or two at the very least, depending on how often you play. Laces won’t come undone – comes with an adjustment system. Sleek, meaning the upper isn’t incredibly durable when faced with extensive use in harsh weather. Like Adidas, Under Armour also have a slightly sporty take on the traditional hiking boot. The actual rubber on the outsole is relatively thin, and the midsole is made of 100% EVA, meaning this is a very flexible shoe. It performs really well on pretty much any shot – no matter whether you’re making a run-up for a tee-off or playing a slow putt. This agility also makes for a very comfortable shoe. The PU/textile upper is pretty flexible, and the back of the shoe is made of a breathable mesh material. There’s also a foam layer near the ankle collar, adding that little bit of extra cushioning. What’s more, the Horizon STR is incredibly light, at only 9.3oz, and the price is very reasonable. The issue with this shoe is that while the sole is very flexible, Under Armour have added a little bit too much rigidity in the upper material. As a result, it’s not incredibly breathable, and it’s possible to develop blisters (especially after hours upon hours of play). Upper is a little rigid. This is pretty much the toughest disc golf shoe out there. If you’re fed up of wearing out your shoes in a matter of months, it’s definitely worth checking out Keen’s product. The first area of reinforcement is the toe. It comes with a tall, thick toe guard, which can withstand thousands of toe drags without splitting. This toe guard then attaches to the even thicker rubber outsole, complete with extremely deep lugs, which do a fantastic job even in frosty conditions. Furthermore, the waterproof mesh upper is reasonably thick, meaning it won’t come apart easily. We’d classify this as a winter shoe – in summer your feet might get a bit sweaty, depending on how thick your socks are. The Saltzman also fits pretty well, and comes with a traditional lacing system – it’s up to you whether or not you’d prefer a dial/pull-to-tighten mechanism instead. The price is OK – they’re not too cheap but are by no means expensive either. However, with the added protection these shoe offer comes excess weight – these are some of the heaviest shoes out there. This isn’t such a bad thing though for most players, especially if you’re playing on courses which aren’t really suitable for more athletic-style shoes. Can get a little warm in the summer. Reasonably heavy compared to other styles of shoe. This is another well-balanced option from Puma. The difference between this shoe and the rest of the range though is the Titantour has a leather upper, rather than being made of synthetics. This material has advantages and disadvantages. Firstly, this leather feels great to wear. Unlike some synthetics, it does an excellent job molding to the shape of your foot. So if you’re worried about your new shoes not fitting too well, this material can help alleviate this problem. In addition, the leather has been treated to make it completely waterproof – Puma guarantees that the upper won’t let in any moisture for at least two years of use. Also, this leather is very easy to clean – you’ll want to wipe it down of any dirt/debris to avoid it deteriorating. The only real downside to leather is it can wear out a little quicker, especially when compared to the mesh synthetics typically seen on hiking shoes. If you maintain it well enough though, you should get a good year or two of disc golf out of these shoes no problem. As you’d expect from Puma, you also get their Ignite Foam material in the insole, which helps to improve stability while also being very comfortable to walk on. Overall, if you like the idea of leather shoes, these are definitely worth trying. Just be aware that this material behaves a little differently to most stiffer synthetics. Leather material isn’t as durable as comparable synthetics. Remember, you and your disc golf shoe are going to go through a lot together. Whether it be the dizzying highs of sinking a hole in one, or the pain of missing a crucial putt, you’ll want a shoe that supports you and gives you the confidence to play as well as you possibly can. So, when shopping, identify exactly what you need. Would a breathable shoe help on humid summer days, or do you need better traction to avoid slipping? Are you fed up of wearing holes in your shoes, or do you need something a little more nimble to improve your putt percentage?